“Our results provide important insights on the impacts of observed climate variability and projected future climate change on streamflow and hydropower production in India, which can assist planners and policy makers. For future planning, careful consideration of uncertainties in precipitation projections, along with robust and comprehensive adaptation strategies, is required,” researchers have observed in their study published in journal Scientific Reports on Monday. 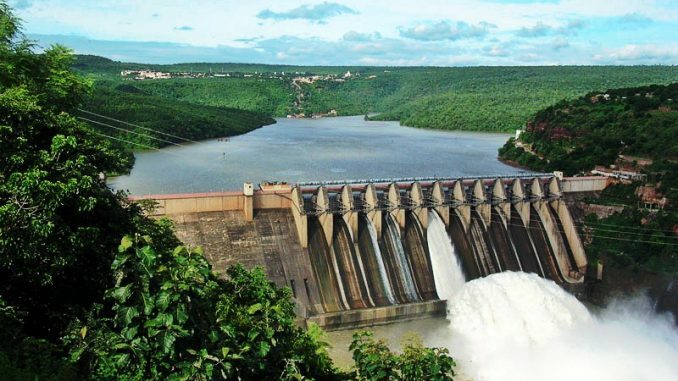 The study is based on observed climate variability between 1951 and 2007, and model simulations for projected climate change under different scenarios, in relation to top seven large hydropower projects – Nathpa Jhakri, Bhakra Nangal, Srisailam, Nagarjuna Sagar, Hirakud, Sardar Sarovar, and Indira Sagar. These large reservoirs are located in four major Indian sub-continental basins – Indus, Krishna, Mahanadi, and Narmada. “There might be a seasonal variability in reservoirs that get streamflow from snow and glacier melt. Due to higher increase in air temperature, flow due to snow and glacier melt is projected to decline in the pre-monsoon season as shown for Bhakhara Nangal and Nathapa Jhakhari projects,” explained Vimal Mishra, Associate Professor in Civil Engineering at IIT Gandhinagar who led the research, while speaking to India Science Wire. Other hydropower projects, he said, might see increase in annual hydropower production under the projected future climate, mainly due to increase in the monsoon season rainfall under the warming climate. It is also likely that the projected increase in rainfall can be due to rise in extreme precipitation events in the future. Most of the catchments of the large reservoirs are projected to experience substantial warming under the projected future climate. The highest warming is likely for Nathpa Jhakri and Bhakra Nangal where the annual mean temperature is projected to increase by more than 6.25 degrees by period 2070–2099 under the Representative Concentration Pathway (RCP) 8.5 scenario. There will be increase in streamflow for the reservoirs located in the central and south India primarily due to the increase in the monsoon season precipitation under the future climate. Other factors like land use and land cover changes will also be critical in future in response to urbanization and expansion of agriculture that will affect streamflow and so as hydropower production, the study says. The projected increase in precipitation and streamflow may also result in an increased sediment load to the reservoirs, which can affect the storage capacity of reservoirs and hydropower potential in future. Moreover, future irrigation demands can also influence the hydropower potential of the reservoirs. “This study does not seem to take into account increased disaster potential of the new rainfall patterns. There are other important factors also such as increased upstream water use, both surface and groundwater, reducing inflows for projects like Sardar Sarovar, Srisailam and Nagarjunsagar,” pointed out Himanshu Thakkar of South Asia Network for Dams, Rivers and People. The research team included Syed Azhar Ali, Saran Aadhar, Harsh Shah and Vimal Mishra from the Department of Civil Engineering, Indian Institute of Technology Gandhinagar. This article was originally published on India Science Wire.